Weather for the June coin show included a recurring pattern of sun, rain and thunder. Just when you thought the sun was out to stay, there'd be thunder and more rain. Then, when you thought the rain was going to be awhile, the sun would come out. In other words, the Sunday coin show's repeating trade-off between sun and rain was just another example of the capricious metro Atlanta weather. But, neither the coin dealers nor the many visitors allowed the changeable weather to keep them from the coin show. Coin dealers filled the tables on the bourse with their showcases full of coins, currency and other collectibles. Here's a huge thank-you-and-we're-glad-you-came to all of the coin dealers and to all of the visitors to the June coin show. This month, the hotel hosted a group of chiropractors attending an educational neurological seminar next door to the coin show. Here's a welcome to the chiropractors who took a break from their training to browse the bourse. Down an intersecting hallway, a meeting room held a bride-to-be and her friends and family in a bridal shower. We hope they had fun, though we're not sure if any of them attended the show. On the Friday before the show, the gold and silver markets dipped in value. Though, both metals increased, albeit only slightly, from their values before the May show. Take a look at the gold charts and the silver charts to see the trends in the metals through the years and their more recent performance. An added chart shows the New York closing values, which decreased from the London market values on the Friday before the show. At the coin show on Sunday, a partial original roll of 1927D Peace dollars changed hands. Can you imagine what those coins looked like? 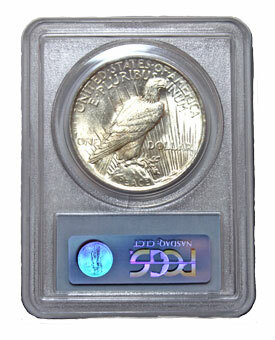 The 1927D Peace dollar enjoys a value in the thousands and tens of thousands of dollars in the MS-64 and higher grades. But, those weren't the only silver dollars changing hands. 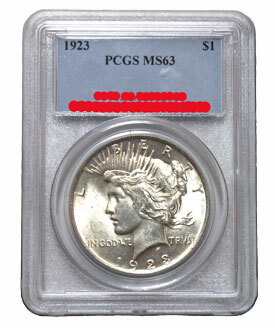 People still like the classic Morgan and Peace dollars for other reasons - not necessarily for their grade. They like to purchase common versions of these dollars in bags or partial bags for their silver content. With the silver market down, this is a great time to buy silver. The problem is finding it in the desired quantities. Sunday's show did have some partial bags of silver changing ownership. On a different silver note, one of the silver proof sets continues to have value beyond its initial purchase price and beyond its silver content. Several of these sets changed from one owner to another at Sunday's show. The set's value is not as high as it once was, but it's certainly a valuable set especially in comparison to other silver proof sets. 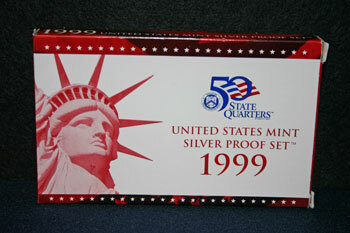 Take a look - it's the 1999 Silver Proof Set. 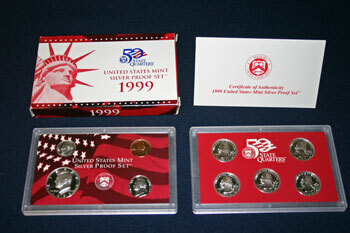 This set is the first year of the state quarter series and contains nine coins of which seven are silver. Perhaps those characteristics contribute to the 1999 silver proof set continuing to be significantly more valuable than the earlier 1990s or the later 2000s silver proof sets. Of course, these numismatic examples are just a small, very small, subset of the interests found at the June coin show. As is usual, our coin dealers displayed a wide variety of coins, currency, bullion and other collectibles. The dealers' interests range from the ancients to the colonial to the modern era coins and currency along with foreign coins and currency, jewelry and other collectibles. The next coin show will be just as interesting with the dealers displaying their broad numismatic interests including any new finds they've acquired in their coin shops or at other coin shows. Make plans to visit the next Greater Atlanta Coin Show on Sunday, July 14, 2013 to see what the coin dealers have on display and to buy, sell and browse their many numismatic and collectible items. Like the weather, the volatile precious metal prices did not deter the coin dealers or the visiting public. In fact, the show had coin dealers visiting to buy and trade with the dealers on the bourse. These coin dealers walked the bourse holding their boxes of slabbed coins. Do you know what a slabbed coin is? It's simply a coin that has been sent to a grading service and returned in a sealed "slab" of plastic that is numismatically safe. The Official Red Book states: "Choice Uncirculated (MS-63) - A coin with some distracting contact marks or blemishes in prime focal areas. Luster may be impaired." In this case, the rays above Liberty have a few indentations and the luster on the eagle is impaired.